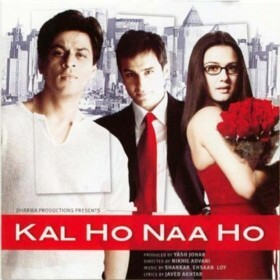 Kal Ho Naa Ho is a International movie starring Preity Zinta, Shahrukh Khan, and Saif Ali Khan. The movie was directed by Nikhil Advani and released by the Dharma Productions studio on 2003-11-28. The movie has an MPAA Rating of PG (Parental Guidance). Our users found the overall impression of this film to be Inspirational. The movie's official site can be found at www.dharma-production.com/khnh_syn.html. I saw Kal Ho Naa Ho years ago when it first came out and loved it. My friend recommended it to me back then because it had a wonderful, familiar setting (New York) and because it had amazing music. I was browsing the movies at my local video store and noticed that it had just been released on blu-ray, so I decided to rent it to see if it still held up after all these years. The story revolves around Naina (who is played by Preity Zinta), and her many problems - her father killed himself, her mother's restaurant is going through hard times, and her mother and grandmother constantly bicker over very controversial topics such as the reason her father committed suicide. A new individual moves in to Naina's neighbourhood (Aman Mathur, played by Shahrukh Khan). Due to a heart condition, Aman is slowly dying - but he encourages everyone to live in the moment and enjoy themselves since you never know what life will throw at you next. Kal Ho Naa Ho roughly translates to "there may or may not be a tomorrow" - and this is basically what the movie is about. All of the actors did an amazing job (especially Shahrukh), though they did overact during some portions of the movie. As you can tell from my brief synopsis, the film has an excellent mixture of emotions and entertainment. The soundtrack is still amazing as well after all these years. Overall, the movie was just as entertaining as I remembered it to be. Seeing everything in high definition was a treat as well. I highly recommend everyone to check out this movie whether it be on DVD or blu-ray, you won't be disappointed :).